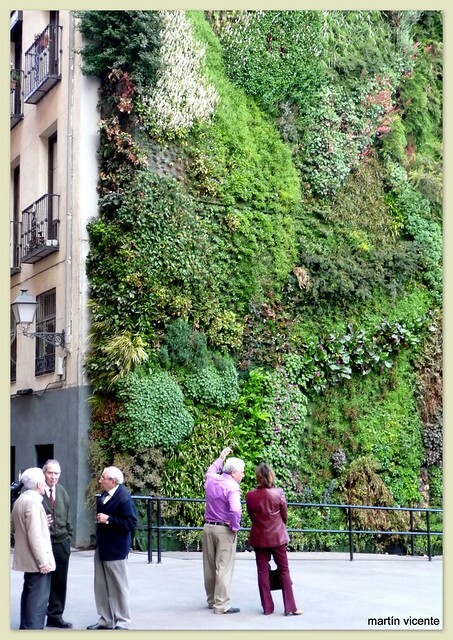 Vertical green wall gardens are increasingly becoming popular today. Such vertical garden walls not only increase the aesthetic looks of the building but also offer almost the same environmental advantage as a green roof in not only improving thermal insulation but also decreasing the surrounding ambient temperatures by reducing the heat absorption. These green walls also have the advantage of using waste water including water resulting from condensation due to air-conditioners etc. Additionally there is no wastage of water and nutrients. Excess water, if any, is collected at bottom and re-pumped. 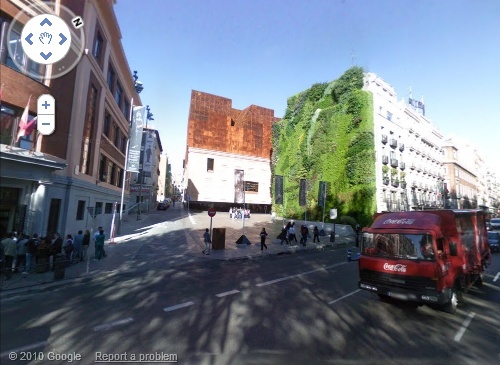 One such garden has come up in the centre of Madrid, on Paseo del Prado - one of the main boulevards in Madrid, Spain. Although it is built on a separate building, adjacent to CaixaForum - a cultural/social centre and art gallery of Madrid, it is part of the development of a very old (1899) power house building into the modern CaixaForum Centre. 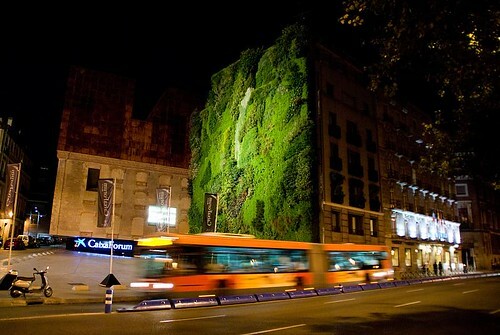 It is therefore commonly referred as CaixaForum Green Wall. 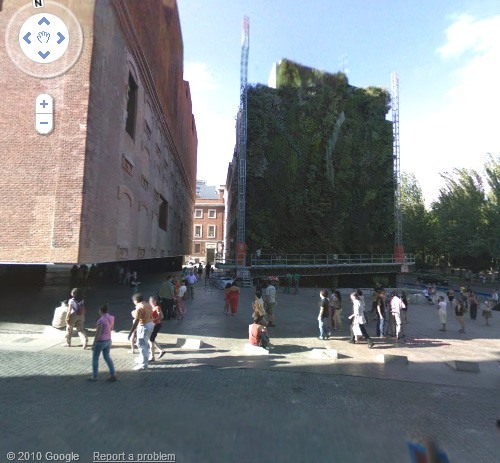 While working on the conversion of the power plant building into Museum, the architects Herzog & de Meuron created the vertical garden in collaboration with famed French botanist Patrick Blanc who is well known for designing such type of vertical or 'Vegetal Walls'. 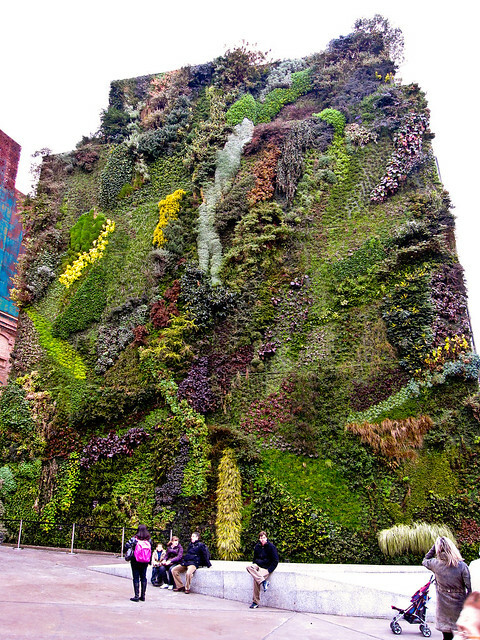 Completed in 2006-07, the vertical garden is 24 meters high and covers an area of 460 square meters within which about 15,000 plants of 250 different species have been planted. 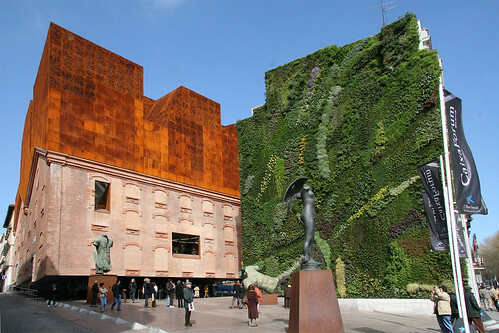 The green wall provides a high contrast with the rust coloured art gallery. In words of the architects their idea was to "create a very unusual encounter between the rough and the natural, ...to incorporate nature so there can be the smell of a garden where you would not expect it."